try between Serbia and Croatia. When he attempted to leave Sarajevo to plead with Serb nationalists to abandon the planned killings, he was arrested by Serb militiamen, placed in the Kula prison, and tortured. 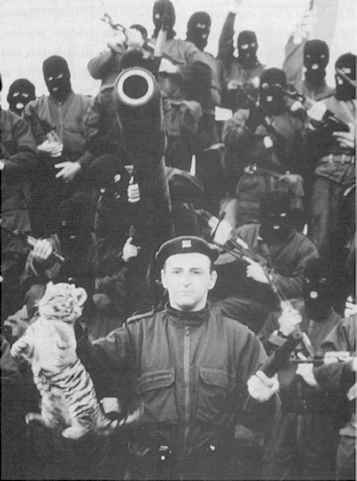 Srebrov is one of many Serbs who have refused the nationalist program of the Serb governments. He is also one of a number of Serbs who have risked their lives and the lives of their families to protect non-Serbs, to denounce the "ethnic cleansing," and to call for a civil society that is not confined to one particular religious group. Osman and Sabiha Botonjic were a middle-class Muslim couple in the town of Sanski Most, not far from Banja Luka. In the spring of 1992 the Serb army had occupied their town with little military resistance. Osman was met at work by a former colleague and told to come to the police station for a few questions. He was first held in a small cell jammed with prisoners, without food or water. Beatings were continual. After several days the prisoners were taken out and thrown onto a truck to be driven to a concentration camp at Manjaca. Of the sixty-five prisoners in the truck, forty-seven survived the journey. Others, weakened by beatings, died of suffocation, thirst, trauma, or blood loss. Osman was held at Manjaca, where prisoners slept on bare ground coated with sheep dung washed in by each new rain. Osman said that many survivors of Manjaca had lost feeling in parts of their body because of prolonged exposure to the cold. A special room in Manjaca was used for torture. to Muslim girls if they were picked up by Serb militias. Muslims were required to display identification marks: white armbands or white marks on their homes. When standing in line for food, Muslims were required to give up their place to Serbs. Sabiha spent one whole morning in line as one after another of her Serb neighbors took places in front of her, until all the stocks were gone. In 1993 Osman, Sabiha, and their daughters started a new life in the United States as refugees. In the fall of 1995 they heard that the last surviving Muslims in Sanski Most had been expelled or killed just before the town was retaken in the final Bosnian army offensive. The Botonjic family's experience illustrates what has been endured by a great many Bosnian Muslims except that they were fortunate enough to have survived intact as a family. What happened to Vladimir Srebrov and the Botonjic family exemplifies twin policies of religious-based violence in Bosnia-Herzegovina: elimination of all dissent within a particular religious group and destruction of the people outside of it. While the media focused global attention upon the shelling of Sarajevo, major events were occurring in the countryside, away from television cameras. Evidence and testimonies collected by the UN Special Rapporteur for Human Rights in the Former Yugoslavia, the UN Commission of Experts on War Crimes in the Former Yugoslavia, human rights groups such as Helsinki Watch, Doctors without Borders, and Amnesty International, and the International Criminal Tribunal on War Crimes in the Former Yugoslavia indicate systematic, widespread, and methodical persecution beyond anything the popular media has shown. and individual massacres were carried out. The term "killing camps" indicates those camps (such as Omarska, Brcko-Luka, Susica, and the industrial site of the Keraterm company in Prijedor) where the primary object of detention was killing. Many of the prisoners appear to have been beaten to death over a period of hours or days. The killing went on daily and nightly. The term "killing camp" is meant to avoid false identification with the death camps of the Holocaust, while at the same time avoiding falsifications and euphemisms such as "detention camp." Manjaca (the camp in which Osman was held), Trnopolje, Batkovic, and other smaller areas were concentration camps; killings and torture were common, but the majority of detainees did survive. "Killing Centers" were places where the victims were brought for immediate or nearly immediate execution. Thus the famous Drina River bridge in the eastern Bosnian town of Visegrad was used for nightly executions and "sport atrocities" against Bosnian Muslims by Serb militiamen; the victims would be tortured and then thrown off the bridge and shot as they fell down into the Drina River. Similar centers were found in Zvornik, Foca, and most other centers of Bosnian Muslim population occupied by the Serb army. captives thought they were being released, they were often disabused of their hope. In the Vlasic mountain massacre, busloads of Bosnians who had been released from the Trnopolje camp were stopped by Serb soldiers and killed. In late 1992, after the Serb army had consolidated the 70 percent of Bosnian territory it controlled, the mass killings changed into steady, individualized killings and rapes. In the fall of 1994, the International Committee of the Red Cross (ICRC) made an extraordinary appeal to world leaders to stop the atrocities. The appeal was ignored. When a town fell to the Serb army, the first inhabitants to be targeted were intellectual and cultural leaders: religious authorities, teachers, lawyers, doctors, business people, artists, poets, and musicians. The object of such "elite-cide" was to destroy the cultural memory of the Bosnian Muslims and Bosnians who would live with them. Gradually, acts of cruelty and massacre took on an interior momentum and logic of their own. In many cases, the Serb population was alerted to leave a village before the killing began. Because the Serb governments have refused UN war crimes investigators access to alleged killing sites and have tampered with mass graves, it is impossible to calculate the number of dead. Whatever the final number, given the small size and population of Bosnia (only four million total population), the primitive methods used for the killings, and the interference by reporters and refugee workers, the killing was methodical, systematic, and of a tragic enormity. ing rewarded by international peace negotiators with territorial concessions, they began their own persecution of Bosnian Muslims, modeled on the actions of the Serb militias.